Back in the 1990s, the arcades were brought back to life thanks to a game called Street Fighter II: The World Warrior. The popularity of the game and its characters told anyone versed in the laws of business that spin-off media was inevitable. And it came in spades. There were several anime adaptations (some better than others), an American Saturday morning cartoon, action figures, comic books, customized game controllers, apparel and just about anything else you could think of. Naturally, a movie would not be far behind. The movie in question, simply titled Street Fighter, starred Jean Claude Van Damme and the late Raul Julia (in his final film) as, respectively, Guile and Bison. This film, written and directed by Stephen E. de Souza (Die Hard, Hudson Hawk), was a disappointment, presenting neither a solid story, nor passable acting, nor even decent fighting scenes. And any fan of the games can tell you, if you can’t even get the fighting scenes right, why bother doing a Street Fighter movie? Later on, an animated Street Fighter movie would be released in Japan and would fare considerably better, particularly with fans. Its story wasn’t really any better, but the fights sure were, and the characters looked and behaved the way they were supposed to. So if a cartoon could capture the spirit of the game, why couldn’t a live action film? Maybe it’s because the filmmakers never can seem to get it out of their heads that their material is based on a video game, and as such they approach it the wrong way: as a “video game movie” instead of a “movie.” De Souza’s Street Fighter even had the cast mimicking the over-the-top attacks of the video game characters, which sorta sounds neat until you realize how utterly ridiculous it looks. So, of course, no one can be blamed when they react less than enthusiastically to the news that another live action Street Fighter movie is on the way, even if it promises to focus on one of the series’ most popular characters. And it’s inevitable that this film will be compared to the one before it. I am guilty myself of drawing such a comparison, though in a few instances such a comparison will work in the new film’s favor. And it needs such an advantage. We now have Street Fighter: The Legend of Chun Li, a story about the First Lady of Fighting Games herself. Yes, Chun Li was featured in the previous movie (played less than adequately by Ming Na), but she was only a supporting character in that flick, and aside from knocking a few heads and spewing some lame dialogue, she didn’t have much to do. So it’s nice to see her finally in the spotlight, portrayed by an actress who actually bothers to put some effort into her performace: Kristin Kreuk. 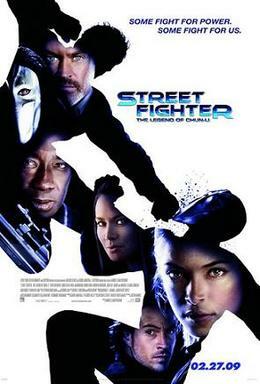 The previous Street Fighter film pretty much failed to give its characters any good development or reason to show any real emotions, making it rather hard to connect with them. This new film at least tries, and even succeeds in some places; when Chun Li sheds tears in this movie, we know precisely why, and we understand her sorrow. She is endeared far more to us this time around. It would not be spoiling anything to say this movie is much better than its predecessor. But is it really a good movie? Well… let’s start with what the movie does wrong. Now, obviously director Andrzej Bartkowiak and screenwriter Justin Marks had a daunting task before them. They not only had to please Street Fighter and Chun Li fans around the world, but somehow try to make a good movie in the process. And, of course, you can’t tell a story about street fighters without the proper pacing. Pacing, in fact, is where the movie’s first failure falls into our laps, as it’s tragically rushed in all the wrong places. Events that should be treated delicately and given sufficient screen time to allow us to appreciate their significance whiz right by us, drastically reducing their impact. Instead of thoughtful remarks, we’re given more passing comments on things that are supposed to tell us more about the characters we’re watching. And, aside from Chun Li, Bison and, to a lesser degree, Chun Li’s father and Gen, none of the characters receives much by the way of development, thus causing this film to fail in the same general area the previous one did. Taboo’s appearance as the masked fighter Vega (known as Balrog in Japan, which the credits acknowledged to my surprise) is essentially a joke; he is given so little to do and so little screen time that he contributes nothing whatsoever to the story. The movie, in fact, would have worked perfectly well without him. The boxer Balrog (called Bison in Japan… still with me here? ), played with gusto by Michael Clarke Duncan, at least has some importance, though we certainly never learn anything about him aside from the fact that he’s difficult to injure and is one sadistic son of a gun. Then there’s Bison himself (called Vega in Japan, and I know that by now anyone who isn’t a Street Fighter fan is probably thoroughly confused). One of the only things the first film got right was its casting of Bison; Raul Julia was perfect for the role and put some solid acting into it. He even looked like the video game character. In this movie, we have Neal McDonough, and while it’s really unfair to judge him by his appearance, there’s also the fact to consider that we don’t see much from him. Yeah, towards the end of the film he does finally show us what a nasty guy he truly is (including one horrifying act committed right before Chun Li’s eyes, which I won’t reveal here), but for the most part, he doesn’t inspire much fear in us. He mostly comes across as some jerk in a suit whom we don’t come to hate as soon as we should. In fact, by the time we’re made to care about what a monster he is, the movie is so far along already that the effect it has is reduced. We should be shown much sooner what sort of villain he is, rather than be given vague hints. Of course, the movie is trying to tell a story, and when it’s not busy rushing it past us, it does give us some things to focus on, such as Chun Li’s relationship with her parents, and her motivation for going after Bison in the first place. The movie, naturally, takes a few liberties with the characters’ established backstories, but it does manage to stay truer to them than the original film ever did. However, Bison’s story is rather odd, and it doesn’t show enough of what he goes through to really help us understand why he chooses the path he does in life. Apparently we’re supposed to accept that he believes strength is worth being evil for, but this is shallow at best. Perhaps if we learned more about him than his traumatic days as a baby, we could more easily buy into what he becomes. And Interpol Officer Charile Nash (yes, the same Charlie Nash whom Guile was so eager to avenge in the games) is on the scene as well; he’s determined to bring Bison down. If only we learned why. Actor Chris Klein and actress Moon Bloodgood (who plays his partner Maya) aren’t given much to do, and what they are given to do isn’t very engaging or exciting. Much of their contributions to the story are tossed out as quickly as they’re flung in, leaving us very little time to appreciate any of it. And Nash’s one-liners, which are, of course, meant to be witty, are not really that witty. Or all that funny. With Chun Li, however, we learn quite a lot, and one of the things this movie does well is make us care about her. We get plenty of details about her life, her family and how she knows what she knows, and she comes across as a real person. Her narration isn’t very well written, but it’s delivered convincingly enough, and what we’re shown tells us much of what we want to know. Her hardships are laid bare before us. When she cries, we feel sad for her. When she overcomes obstacles, we cheer for her. And when she decides to better herself and do what’s right, we share her happiness in every little difference she makes. Kreuk isn’t the best actress out there, but she’s good enough to convince us that Chun Li’s feelings are genuine, and she’s graceful enough to make us believe she really can fight. In fact, let’s talk about the fighting. The first film failed big-time here, and again, what is a Street Fighter movie without fighting? Well, this film delivers. A few of the fight scenes are a little on the quick side (much like the story), but the ones that last longer than a couple of moments are fun to watch. The choreography is nothing new or innovative, but it doesn’t have to be; it’s exciting to see and that’s what really matters. Chun Li even gets to use a couple of her video game moves. Now, I know what you’re thinking, but let me assure you, it doesn’t look goofy here the way it did in the last film. She uses her trademark Spinning Bird Kick only once, but the way it’s used is believable enough that we can buy it without too much trouble. And during the film’s climax, she even throws in an airborne Lightning Kick, which is done so quickly you’ll miss it if you blink. Then, of course, there’s her fireball, the Kikoken, which comes into play. Gen (played rather stiffly by Robin Shou, already known to fighting game enthusiasts as Liu Kang in the Mortal Kombat films), a former criminal, takes Chun Li under his wing and teaches her a few things, including how to harness the power of Chi to produce, among other things, a fireball. I really like the way the film handles this, especially when Gen uses the Chi to heal one of Chun Li’s wounds (but still leaving a very noticeable scar), because it treats it far less like magic and more like a genuine natural force. It’s not whimsical, either, but very much a part of the story, and realized through computer effects that are fortunately not too flashy or exaggerated. On the whole, the movie doesn’t quite work. It has some good ideas and an interesting story, but it really doesn’t handle them properly. For every strong moment the film has, there is a weak one to bring things down again, and of course there’s an open ending, though if they actually make a sequel to this I’ll be amazed. I likely won’t be the first in line to see it, though. I probably won’t see the movie again, either… well, not in the theater, anyway. I may buy the soundtrack, however; the music wasn’t half bad. If you like solid electronic dance tunes, the soundtrack may be worth your while. The movie, on the other hand, won’t really entertain general audiences, and I imagine fans of the games will be pretty divided on it. Oh, and they mispronounced Ryu’s name. AGAIN. Final score: 6/10. Nice try, but try harder next time, guys. What color Is my avatar?